Ftechnics Meta trader 4 bridge is a solution that allows institutional clients to easily connect to liquidity providers with low latency and receive in time price. 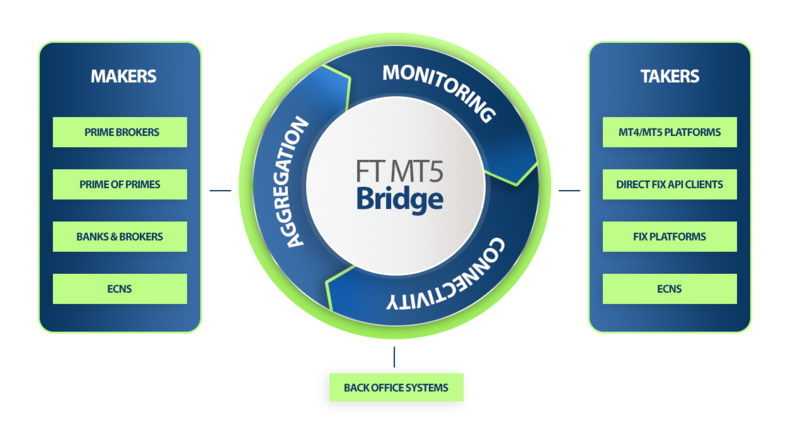 Ftechnics Meta trader 5 bridge is a solution that allows institutional clients to easily connect to liquidity providers with low latency and receive in time price. Turnkey solutions: Why not start today? A regular Ftechnics WL takes on average 2 business days to build from the time a NDA and a White Label agreement has been signed and necessary transfer has been completed. Join the ranks of some of our positively surprised clients that had their White Labels delivered within same day. * 2 business day average is an estimate for Ftechnics product White labels. Any WL that is required to be built by vendors like Metaquotes may take longer. Unlike other solutions, Ftechnics is with you from the first day to last day you work with us. We do host the necessary servers for your business, we do pre-set and provide your backoffice, we do WL the product for you. We even offer data feeds for Foreign Exchange, CFDs, Options and Forwards. News content and assistance for you to find an STP broker if needed is also complimentary. An off the shelf product from some solution providers in the industry may cost you up to $100,000+ purely for the license fees. We do understand the concept of ‘start-up’ and provide one of the most affordable prices in the industry. Although Ftechnics is a solutions provider, some select brokers offer subsidized packages to our customers to provide STP services. With this service, start up brokers may reach high quality services which are up to 90% subsidized on monthly maintenance costs. You serve your clients, have them pay your bills! Are you an ECN broker? Do you offer straight through processing? Can I use expert advisors with you? Do you offer mobile trading? How? Do you offer API trading? Your answer can be ‘Yes’ to all above questions with our help. And for the terminology you are not familiar with, we are here to help you succeed.